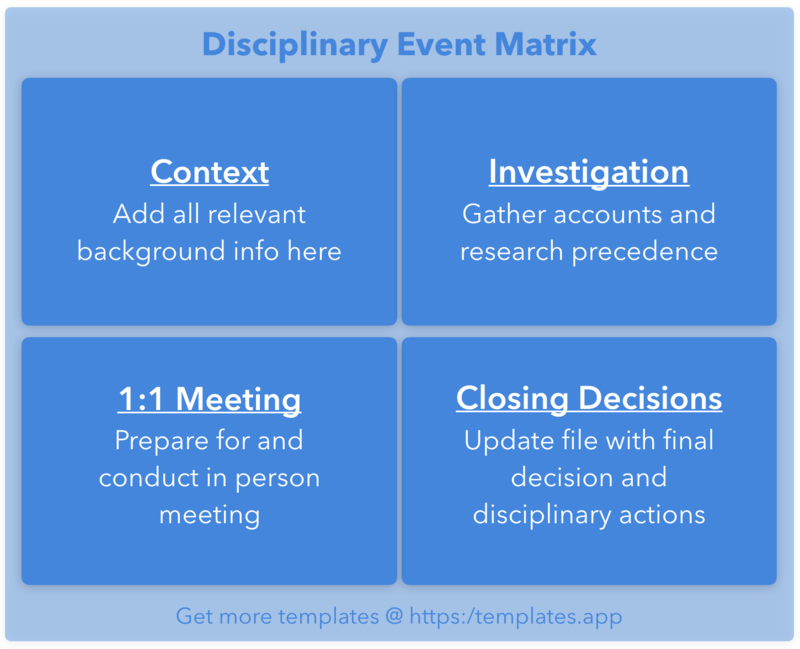 A disciplinary event creates extra work for a human resources professionals. Because these events are obviously not planned, they can come at an inconvenient time. The disciplinary event matrix helps one follow through on all the action items required in a timely manner, no matter how busy one already is. In Quadrant One, you will follow steps to take down all necessary context that will be required as your proceed through that process. In Quadrant Two, you will perform your investigation of the allegations, interviewing witnesses and compiling the notes carefully. Quadrant Three, you will prepare for, run, and follow up on the 1:1 meeting you will hold with the employee under review. Quadrant Four, you will complete all the steps needed to successfully close this disciplinary report and update all necessary personnel files. You can import this template into your own Priority Matrix here.